Click here for Part 1 of Daniel Williams's story. When we left off, Daniel Williams was a successful merchant who bought 103 Callowhill Street on March 6, 1770. For the next part of the story, in which I look at Daniel and his family's lives during the Revolutionary War (1775-1783), I first want to backtrack slightly. Daniel and his family were Quakers, and the Revolutionary War posed a problem for Quakerism because one of the major tenets of the religion is strict pacifism. Quakers could be kicked out of the society, aka disunited, aka disowned, aka "read out" during Monthly Meeting, for engaging in any kind of conflict or warlike training or even just for carrying a weapon; their philosophy was that any and all violence is wrong, even for the purpose of self defense. In the lead-up to the Revolutionary War, the measures Quakers supported as a means of resolving trade-based conflicts between Britain and America were diplomatic solutions such as boycotts. One of the most important of these was the Resolution of Non-Importation Made by the Citizens of Philadelphia, which was created in response to the infamous Stamp Act and signed by 373 Philadelphian merchants on October 25, 1765. As you can probably guess, Daniel Williams was one of those signatories. 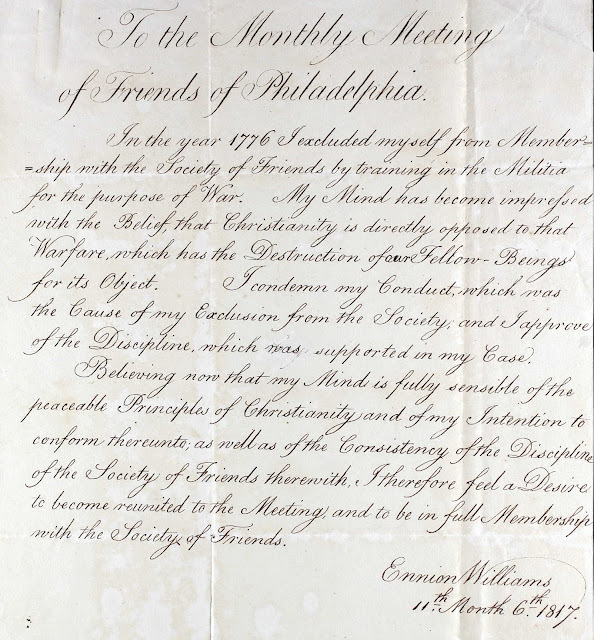 Excerpt from the Resolution of Non-Importation Made by the Citizens of Philadelphia, showing Daniel Williams's signature at left. Incidentally, in the next column is the signature from none other than Sheriff Joseph Redman, mentioned in part 1. This Resolution helped bring about the repeal of the Stamp Act, but of course, Britain persisted in trying to bring those uppity colonials to economic heel, and peace was not to last. The first Townshend Act was passed in 1767, and the Colonies once again launched protests, with the most strenuous and organized objections coming from Boston. 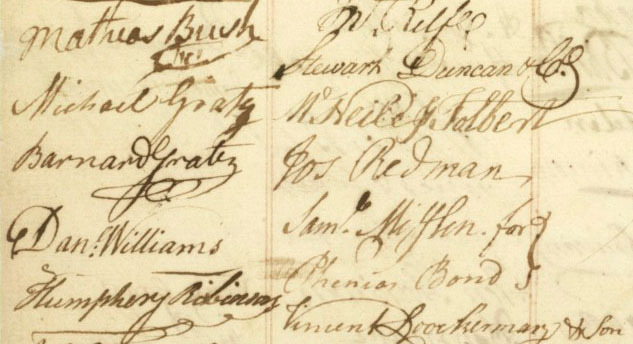 At this point, Philadelphian merchants sent petitions to Britain, but I can't find another signed pledge like the Resolution of Non-Importation, which is probably why Williams & Eldridge were able to open their imported textiles shop in 1768. The deteriorating situation, however, may have contributed to the dissolution of Daniel's partnership with Samuel Eldridge in January 1771. Suitable to the season. September 21. tbc. 12w. Even as a childless woman, I have so much trouble comprehending what it must be like to have ten children die in infancy. Hannah Callowhill's family has a similar story: she was the only surviving of seven children. How did parents cope with tragedy like that? Did they somehow get used to it? Was PTSD just a normal state of being? We have modern studies on the devastating effect of one child's death on parents; what must it have been like to live in an age when it routinely happened ten times to a single couple? It seems unbearable. And yet, after the deaths of ten of his babies, Daniel Williams was starting a new business and continuing to be heavily involved in society. But back to the surviving adult sons. When war officially broke out in April 1775, Edward and Ennion were 25 and 23, and ready to fight the Redcoats. They enlisted in the Continental Army and began military training and exercises, and in September, when the Arch Street Quakers Monthly Meeting found out, they took steps to address this, sending several Friends to "labour further to convince them of the inconsistency of their conduct with our Religious profession & principles." I took leave of my dear brother as if it was the last time we should meet again in this world. At the same time requested him to respect a certain young lady as the particular object of his brother's attention and to my parents, brothers and sisters. Friday, 20th. Breakfasted at Mr. Connor's. Dined at Cambridge. Drank coffee at Mr. Mifflin's, supped at Brown's, and joined in an Indian frolic, which to me has been the most unlucky accident since I left home. I think an "Indian frolic" is a wild and drunken party? Ennion Williams, by Charles Wilson Peale. 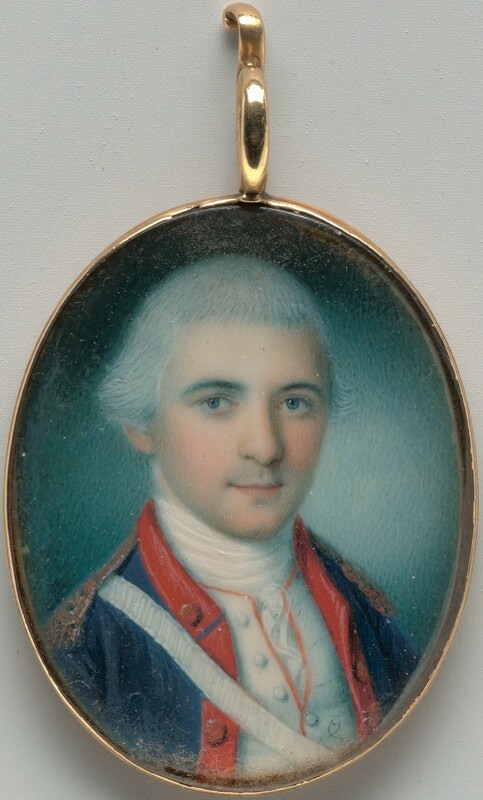 From the Met's website: "The artist recorded on October 26, 1776: "Rd. of Mr. Williams 28 Dolrs. For his Miniature," and later that day, "put a Glass on Mr. Williams Min: Miss Williams having broke the first for which I expect 10s." "Edward Williams and Ennion Williams of this City having been educated in religious profession with us the people called Quakers; but contrary to our Religious principles have in this time of Commotion associated with others in training to learn the warlike exercises, for which it became our concern to treat with Each of them; but our Labours of Love not prevailing, and they still appearing unconvinced of the rectitude of our peaceable Testimony against war; we think it incumbent on us to declare, that by their deviation herein, they have excluded themselves from being members of our Religious Society until from a just Sense of their outgoing, they shall condemn the same, to the satisfaction of this meeting, which that Each of them may be enabled to do, through the assistance of Divine Grace is our desire for them—"
Disowned at the same time as Edward and Ennion were several other Arch Street Quakers who chose to serve in the Revolutionary War, including at least one person, William Crispin, whom I can confirm joined the Free Quakers, an offshoot gathering of "Fighting Quakers" or "Wet Quakers" who wished to adhere to all the Quaker principles except the one that prevented them from fighting the British. I don't know if Edward or Ennion joined the Free Quakers as well, as Free Quakers didn't keep thorough member lists, but it's possible. I can't find too much more about the Williams family during the Revolutionary War. In February of 1777, Daniel was listed as one of three parties connected to the sale of a house in Germantown, but nothing else was advertised for the rest of that year and for almost all of 1778, probably because the British captured Philadelphia. I hope that house in Germantown sold OK, because the British stationed about 9,000 troops in that area. Just to round this all out, let's skip forward and follow the story of Ennion Williams through. In 1817, more than 20 years after the death of his father Daniel, and 42 years after he was disunited, Ennion surprisingly applied to rejoin the Society of Friends by repenting of his involvement in the war. Letter from Ennion Williams to the Arch Street Monthly Meeting of Quakers, November 6th, 1817. His acknowledgment was accepted, and he joined the Western District Monthly Meeting on 12th Street. But then, amazingly, when he was 75 years old, he became involved in challenging the Quaker status quo yet again during the Great Separation of 1827, when so-called "Hicksite" Quakers split off from "Orthodox" Quakers. Since he had begun meeting with the more universalist Hicksites, he was once again disowned from the society he had joined, along with all the other Hicksites. I sort of hope I'm still rocking the boat when I'm 75. Ennion Williams died on February 12, 1830, at age 77.